Welcome to Gartersnake.info. If you have questions about keeping garter snakes as pets, start with the Care Guide. If you have questions about garter snakes on your property, or would like a snake identified, please read the FAQ. Be sure to browse the articles and answers to reader questions as well. Thank you! On May 5, 2014, I visited the Narcisse Snake Dens. 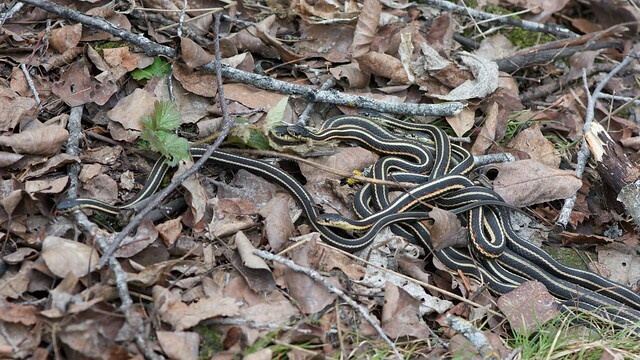 Located about a hundred kilometres north of Winnipeg, these dens are the hibernation site of tens of thousands of Red-sided Garter Snakes (Thamnophis sirtalis parietalis), the prairie subspecies of the Common Garter Snake. When they emerge each spring, they’re something of a tourist attraction, one that gets featured in the Canadian media. I don’t know how many government-supported tourist attractions there are in the world that are dedicated to snakes and snake conservation, but there can’t be many, and this is one of them. For anyone interested in garter snakes, or even snakes in general, the Narcisse Snake Dens are a must-visit. Every spring, the garter snakes emerge ready to mate. A single mating ball — a large female surrounded by anything from several to dozens of male suitors — is impressive enough, but when thousands are out and about in the same location … well, you’ve never seen snakes so thick on the ground. Why Do Garter Snake Keepers Like Garter Snakes? Why Don’t Reptile Keepers Appreciate Garter Snakes? About 250 Plains Garter Snakes that were removed from a house near Regina, Saskatchewan last fall were finally released over the weekend (see also). The snakes had spent the winter at a wildlife rehabilitation centre. Garter Snake Hibernaculum Disturbed in B.C.